Ditto to what Ruck just said. I’m as nervous as a crackhead In church. Hopefully, our administration has a Talent Management Program/Strategy (i.e. Succession Plan) that prepares organizations for growth and turnover (planned/unplanned.) Specifically, each employee's "career time" (regardless of their title, department, status/level, etc.) is assessed vs.
- professional training and mentoring to prepare an incumbent for such career "turns", etc. MA's retirement is not a surprise; so, we should have had a list of qualified (internal and external) candidates identified and ready to pursue/interview. Our reliance on a national search committee and "deliberate timeline" to select our next HC gives me pause. And like many fellow posters have stated, (a) we do not have the luxury of waiting while in the midst of crucial recruiting season...(b) how will a drawn out process influence current team members and coaching staff? Maybe we will all be pleasantly surprised and have a new coach in time for Christmas. Agree, surely RJ has a short list of candidates both internal and external... This would parallel K State not having a plan in place for Snyder...As I scroll through my twitter timeline, I have seen all of these in house visits being made by Citadel, Furman, Chatt, etc... I keep coming back to the fact that we need someone in place by Dec. 29... A few days before the boys return... That gives 2 weeks before the Contact Period opens back up Jan 11... We must not sit on our heels too long, because we will lose a lot of these kids we want... If I was a prospect, I wouldn’t commit to a program without a HC... Wouldn’t happen... As I stated before, 16 Days is long enough to hire a quality person whether they be in the building now or not... And for this search committee? Cmon, really? As AD, you know our core values... Figure out who the best guy is that fits that mold and let’s roll. If Fuqua is the key (and I hope he is) HE is coaching in a bowl game today against Western KY in the Cure Bowl. I would assume that the hold up may be to let him coach his Bowl game before being able to drill down and make a deal happen.....AGAIN..this is IF Fuqua is at the top of the Coaching search list.......That would add up to the perceived "hold up"....My Druthers would be for him to come back and get Shadon Brown back from Colorado as the DC or promote Riase to the position.......I do not know the $$$ each are being paid and what those positions we would offer compare, but That would be my preference. You could keep WL as OC and groom Freddie Brown to be in the wings for that spot in the few years left of WL's career. You could also keep NAsh and Dane and Woods all intact and Wofford would be humming along business as usual. Ruckus wrote: MA would make a great AD BTW. How about Ma as quality control auditor for the AD? I'd be on board for that. That very well could be and if so, I would be very happy with that. If so, at least the national search would cross county and state lines. Maybe it's much ado about nothing and we could be on tap for an early week press conference. I hate to say it, but Woody or Fuqua are likely well out if the Wofford price range. Not to mention being successful FBS coordinators only increases their earning potential. Coming back to Wofford would be a significant step down in their career trajectory unless this is their dream job. Had this thought watching Nate's team today with the kids. Would be pretty hard drawing Shadon Brown back with anything less than HC position. Colorado already has him tagged with a 200k salary. Fuqua reportedly around the same at 180k. Coach Chadwell is @ 180k at Coastal. I would be guessing but one would think coach Ayers was around or just above the median. ETSU and some others have come up with stipends and incentives that would put a HC in the 250k range. I think the next step in building our athletic program, and I'm no finance guy so I don't know how it works, is to invest in coaching salaries. We already have all the facilities we need (except for a track) to be successful in division one. Heck, even for academics and the new arts center we've built what is needed to take the next step as an institution, but I think we need to be able to pay people more. -Offer use of Corporate Cars. Having a local auto dealer sponsor coaches. We already have deferred compensation. Ayers makes about $250K plus with it, I have been told. Coaching salaries are always on the rise and it's rare to see a replacement come in for less than the previous coach unless you are going from a long time coach to a really young guy and even then not always. If Wofford wants to sustain their program in the current climate the total coaching salary pool is going to be greater in 2018 than it was in 2017. That goes for if WL is hired and we just hire one new coach, or if we go outside and bring in someone who releases everybody, or anywhere in between. So if Fuqua makes 180 at Ga State, you think he wouldn’t come here for 175? I don’t agree... Be able to run your own program and be in control of a lot of things, he’d do that in a second... If he wants to keep climbing the ladder, he’d have an easier path at an ACC Coordinator job coming from a head coaching position... Look what Moorehead did at Fordham... Franklin hired him at Penn State as OC and now he’s HC at Mississippi State...A lot of these guys want to climb... Look at Houston... LR, Citadel, James Madison... 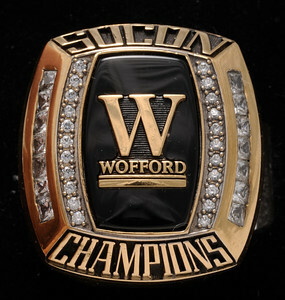 I am not saying I am in favor or the climb someone may want to take coming to use Wofford as a springboard... I am simply stating the way a lot of these guys think... It may be safer to take a guy like Woody or Lang, who you know that this would be their Lone Ranger... Truth be known, I am in favor of any of those 3, because they are Wofford guys and the staff would stay fairly intact.